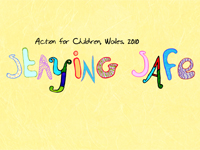 Action for Children’s Hawthorn project and their now experienced young film makers have decided to make an animated film on safety issues. They worked with the award winning animator and Curious Ostrich collaborator Joelle Brindley over a one day workshop to produce this pilot film. In September 2010 they will start production on their main project working with Joelle, Sharron Harris, Pip Lewis and as ever supported by Action for Children’s Charlotte Phillips.